What is Corporate Software Inspector? Corporate Software Inspector includes an authenticated internal software inventory scanner. It can assess the security patch status of more than 20,000 programs running on Windows, Apple macOS and Red Hat Enterprise Linux (RHEL) platforms. It delivers patching, configuration tools and hundreds of pre-configured patches for non-Microsoft applications running on Windows platforms. The seamless integration with Microsoft System Center and Windows Server Update Services for security patch management means you maximize your investment and manage patching of non-Microsoft products easily from within Microsoft System Center, using your existing infrastructure. Will Corporate Software Inspector be a good fit for my organization? Corporate Software Inspector is used across multiple segments, including Fortune 1000 companies, small to medium-sized businesses, consultants and managed service providers. Our scalable, secure, end-to-end solution works equally well, whatever the environment. 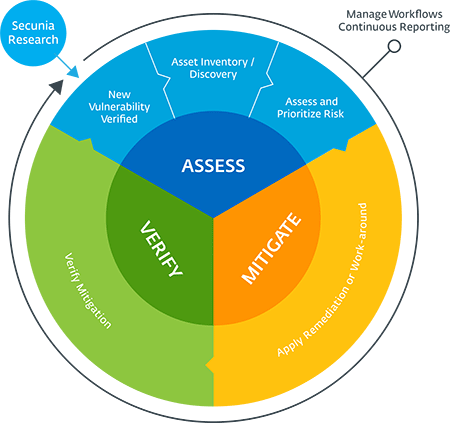 Verified, accurate and timely intelligence from Secunia Research enables you to prioritize remediation activities. Multi-platform scanning for accurate inventory of all software in your infrastructure and correlation with our vulnerability database for effective risk prioritization. You get complete visibility of your systems, stay current and reduce the cost of your patch process significantly. Corporate Software Inspector can be integrated with your preferred patch deployment solution. Integrates seamlessly with Microsoft System Center and Microsoft Windows Server Update Services. Software vulnerability management is critical to the security of organizations’ infrastructure and assets. Corporate Software Inspector combines software vulnerability assessment and security patching to assess, mitigate and verify the patch management status in your organization.